BD2000 is a two layer waterproofing system consisting of BoneDry™ waterproofing membrane, BiLar™ polyolefin barrier, and the DrainMax™ (or Pipe and Stone) foundation drain. 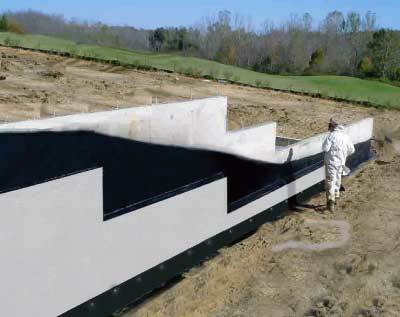 Because BiLar™ is available up to 10’ wide it can span most basement foundation walls with any seams or splicing. See the BoneDry™, BiLar™, and DrainMax™ specification sheets for more information on the individual components of this system. The BD2000 waterproofing system was designed for medium duty waterproofing applications such as retaining walls, poured basements, remedial waterproofing, areas where backfill material may damage waterproofing membranes, and anywhere else a seamless waterproof barrier with a protection course and drainage is required. BoneDry™, BiLar™, and DrainMax™ all come in easy to install formats that increase the productivity of your crews. BiLar™ and DrainMax™ can be installed over BoneDry™ as soon as it’s sprayed thus eliminating costly time delays associated with many other spray-applied membranes.